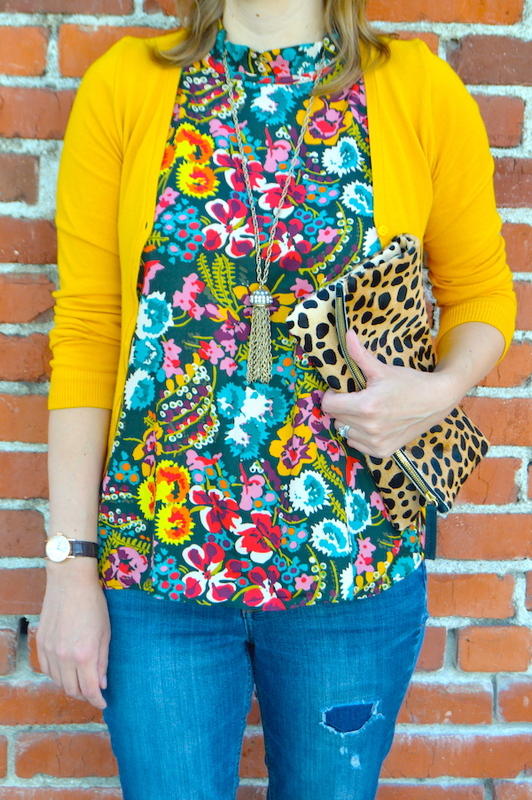 I am really in love with all of the folklore inspired floral prints for fall! First of all, they are gorgeous. Second of all, the myriad of colors they feature makes them incredibly versatile. Take, for example, this floral shell from LOFT. It goes with just about everything in my closet so the possibilities for styling it are endless! 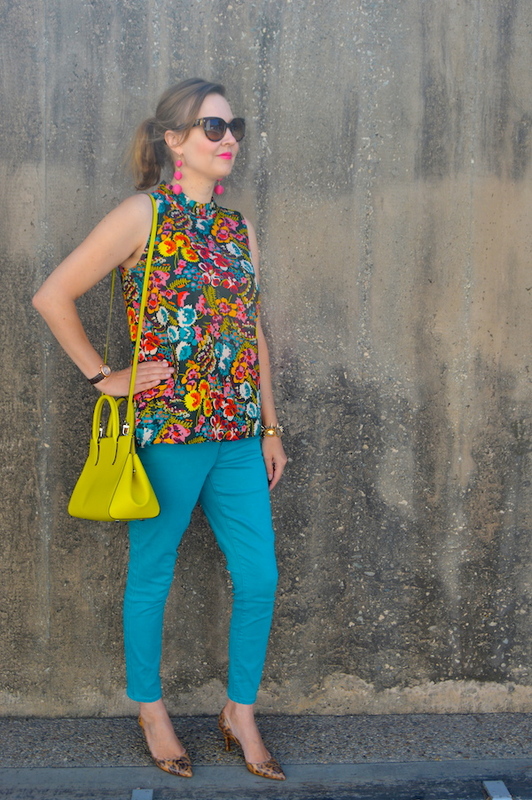 Case in point, I am styling this top in two different ways to demonstrate its immense versatility! 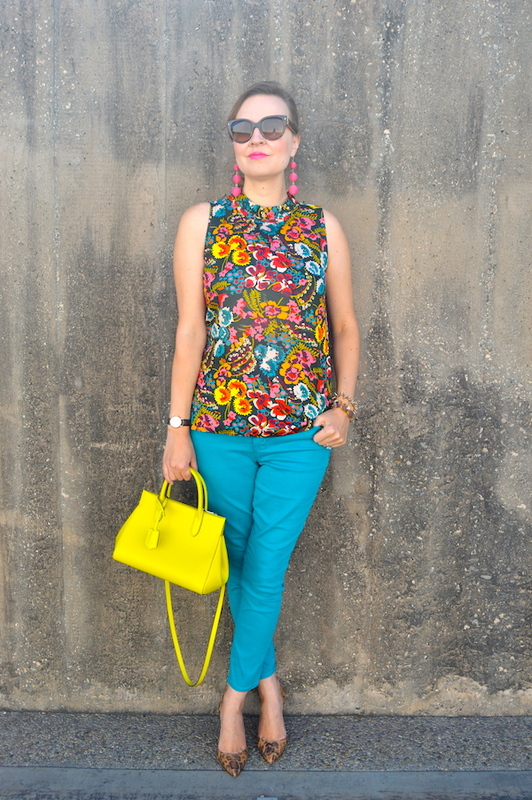 In this first look, I decided to go for a causal look by wearing the top with jeans. Although I love the top, I actually think my favorite part of this look are the velvet shoes! These velvet loafers from Forever 21 were only $19 with a coupon a few weeks ago! The icing on the cake is that they are also super comfy. I am absolutely obsessed with velvet shoes as of late; I think I have probably purchased five pairs in the last few weeks! Luckily, they have all been under $50, so my wallet hasn't taken too much of a hit from my latest obsession! The second iteration of this look is also pretty casual but I decided to amp up the color with the addition of a few bright accessories. 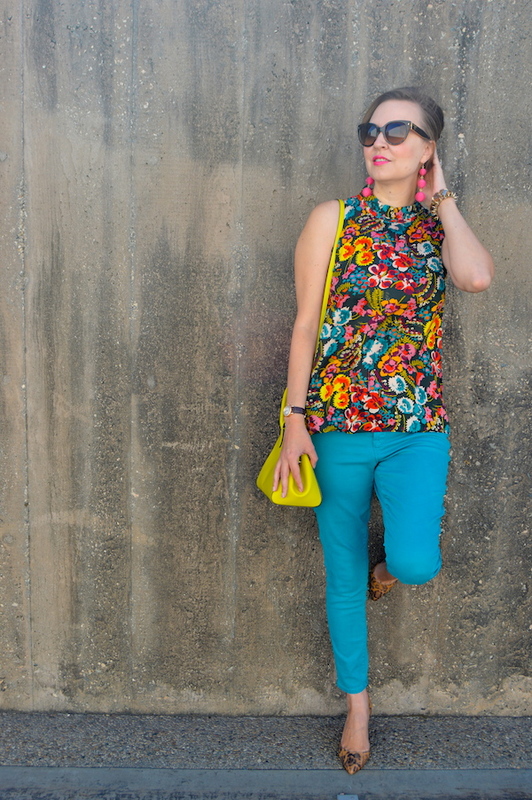 The pop of color from these jeans really plays up all of the lovely colors in the top. 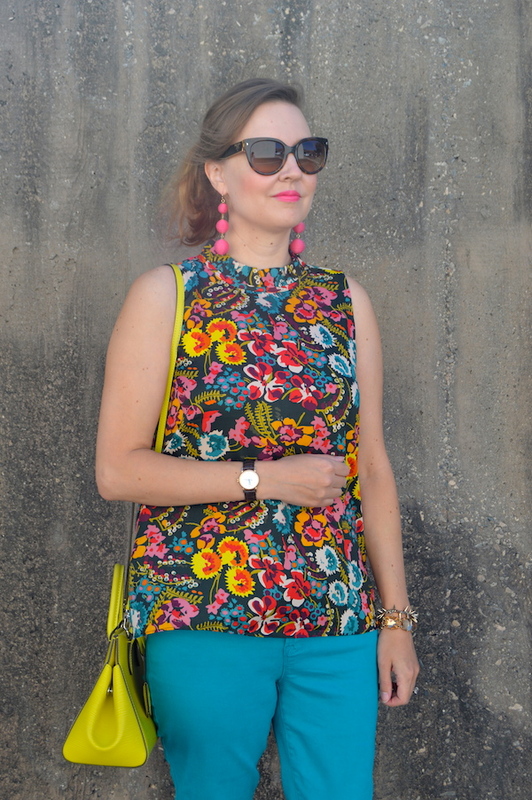 Even my husband's grandmother was a big fan of my top and commented on how many colors it could be worn with! As the weather gets cooler (hopefully that happens sooner than later! ), I hope to layer it or fall and winter. I would also love to style it with a velvet or a corduroy skirt, so stay tuned for it to pop up again at a later date on my blog! 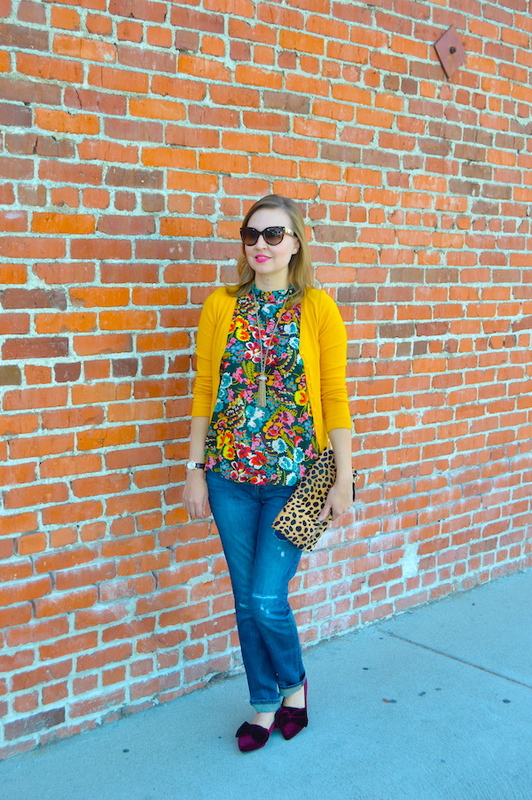 For now, though, enjoy these two transitional fall looks! I love everything about these outfits! 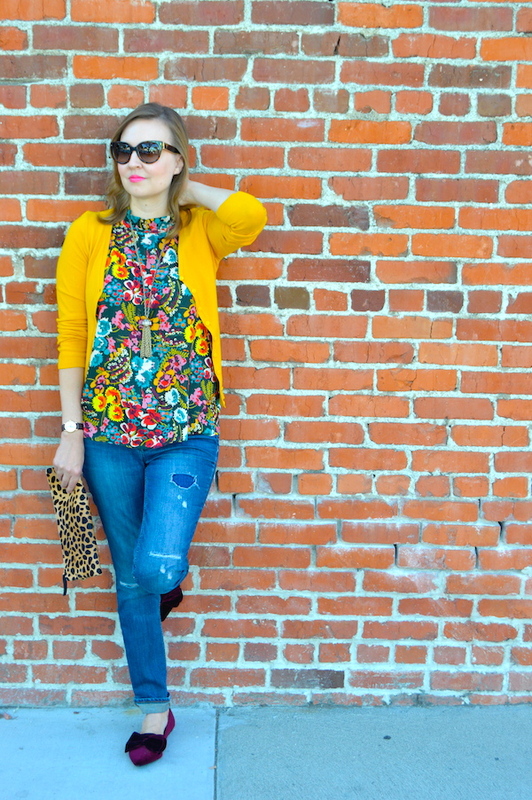 That shell is perfect and I love how you paired it with that bright mustard cardigan! Plus...I may have to go try to find those velvet shoes! My experience with Forever21 shoes is mixed. Are they comfy? Oh I can see why you love this top so much! It is so vibrant and fun and super versatile. I love both ways you have it styled. And the possibilities are quite endless, I'm sure. Those velvet loafers are perfection, too! Thanks so much for linking up with me On the Edge! 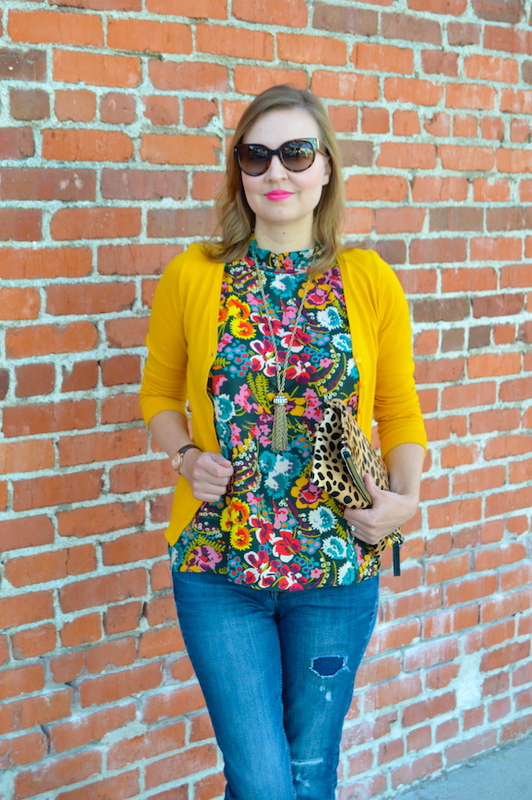 Love the bold floral top and can see it being so versatile. I really enjoyed seeing the two different ways you have styled it here. Also, I cannot decide which of your shoes I need more! Thanks for linking up with Fabulous Friday!